The Osbournes return to DVD with a second serving of foul mouths and rock star hijinks. During the course of the latest 10 episodes, the kids continue to run away from maturity while Ozzy and Sharon show what they’re made of and provide the humanity in what is otherwise a circus sideshow. Following up on the dizzying success of the first season, the second season finds the whacked out family taking off in different directions. Ozzy and Sharon travel to Washington to meet the President even as Kelly journeys from London to the MTV Movie Awards in pursuit of her own music career. All the while, Jack pursues the likes of Natalie Portman, Mandy Moore, and other skirts. This time, the family ties grow as Sharon’s previously estranged father makes an appearance while Ozzy becomes a grandfather when his oldest daughter, Jessica, gives birth. Quietly addressed, at least by Osbourne standards, is Sharon’s fight with cancer. That fight brings out the best in Ozzy, as he exuberantly shares the news with his fans during Ozzfest that his wife is doing great and they’re going to beat the cancer. The two hate being apart and they are indeed the strangest, most romantic couple since Morticia and Gomez Addams. 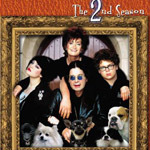 The series shines when Ozzy enters the picture, has heart when Ozzy and Sharon renew their vows, and is bizarrely hilarious when Ozzy works out to the soothing music of Bette Midler and is mesmerized by the bread-baking channel on cable TV. Trouble arises, however, almost every time Kelly and Jack make an appearance. They earned some slack during the first season for taking part in this life under glass experiment, but now they seem to be playing off of it. Somebody needs to give those kids a real job working for a couple soulless tyrants so they will finally shut up and appreciate what they’ve got and how incredibly good they’ve got it. Watching Kelly’s Las Vegas birthday party was borderline torturous, between her underage diva whinings and Jack trading in his dreams of partying hard for lounging on the bed watching Teletubbies. It’s time to get a grip, kids. After two seasons, it’s still the bottomless devotion between Ozzy and Sharon that provides the show with its most redeeming moments. If only Jack and Kelly would move out and go to college so MTV can spin off The Ozzy and Sharon Show. In many respects, the second season’s DVD set feels second rate. As with The First Season, The 2nd Season offers audio commentary, deleted scenes, and the Ozzy Translator. One improvement the second season’s DVD offers is the inclusion of both censored and uncensored audio tracks on the same discs (the first season had separate DVD editions for this audio option). Aside from that, the new set lacks the innovative spirit of the first set. While the menus are humorous, they’re not as extravagant as the first season’s and the second season DVD overall offers fewer extras. On board are a couple games. One, Dookie’s Revenge, is a set-top game in which the player’s mission is to direct one of the Osbourne dogs to a target poop site. Play it once and never admit it. There’s also a What the $%#@ Did He Say? game which gives viewers the chance to guess the correct translation of Ozzy’s slurred speech. The first six episodes offer a running commentary from Sharon and Kelly. Staying “in character,” Kelly whines a lot. Their commentaries are basically vapid and rehash what’s on screen rather than offering behind-the-scenes information. Most of the time, they simply watch the show because it’s the first time they’ve seen it themselves. As if having lived it doesn’t factor into the picture. Things lighten up when Ozzy chips in on the commentaries for episodes 7 through 10. Adding some mystique to the proceedings, Amy (Sharon’s pre-Ozzy child), makes a very quiet contribution to the final four commentary tracks. From her all-too-brief contributions, though, it can be determined that the family ‘tude comes primarily from the mother’s side. Crazy Training is the main DVD-ROM attraction, a game in which players train to become a member of the Osbourne household. Animated games share the screen with the show and it is a fairly clever feature. The games are timed with activities within the show, such as knife throwing, dog petting, foul-word watching, and, naturally, poopie sightings. Once again, straight from cable TV to DVD, the picture is fine and the audio is presented in sharp Dolby Digital Surround. English captions are available, and for those so inclined, there are also French subtitles.